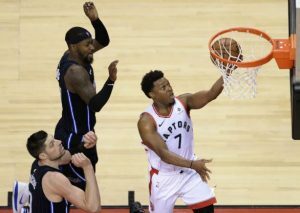 The Toronto Raptors were hungry for revenge after being embarrassed on their home floor by the Orlando Magic in game 1. Coach Nurse and his squad had a couple of days to break down the film and get a few practices in to figure out what adjustments were needed before going into tonight’s matchup. The Raptors were saying all the right things in interviews in between games. They were calm and poised, confident in their game plan and ability to execute. Kyle Lowry shrugged off his poor shooting night, focusing on the fact that he contributed positively in his time on the floor even if it didn’t reflect on the stat sheet. Despite their poor performances, confidence was high heading into tonight’s game and when the ball was tipped, we saw a very different Raptors team. The Raptors were able to unlock another level, led by the positive play of Kawhi Leonard and the resurrection of KLOE. They raised their intensity and looked sharper, more focused and fully engaged. Everyone moved with purpose and positive intent. 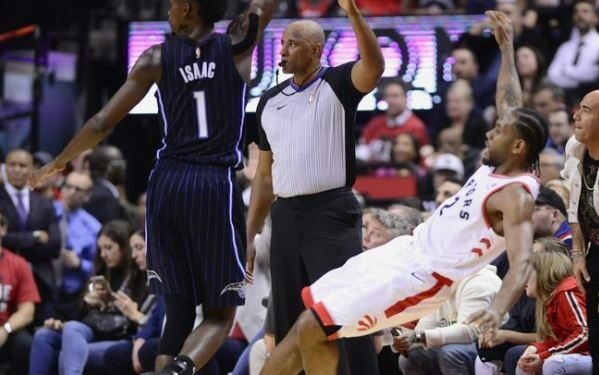 Toronto passed the ball well and played with energy that the Magic were not prepared, or equipped, to handle. Coach Nurse rightly identified the Magic’s dependency on the pick and roll, and ensured his team did whatever they could to bust the play whenever Orlando ran it. The Magic were struggling to keep pace and unlike game 1, they were thoroughly outplayed from the point guard position. Toronto’s attack was led by Kawhi Leonard who put in an MVP performance. Alongside him, Toronto got solid D from Marc Gasol, consistent play from Pascal Siakam and an impressive comeback effort from Lowry. The Raptors were able to punch back and dominate the Magic to even the series. Toronto found themselves over these last few days and looked like the (scary) team that everyone expected to see. That’s more like it. Lowry faced the most criticism after game 1 and was under a microscope heading into tonight’s action. However, the question of which Kyle Lowry would show up tonight was answered early in the first quarter with a make from the foul line. Lowry was doing all the intangibles we have come to expect from him. He contributed all over the stat sheet with 22 points, 4 rebounds, 7 assists, 2 steals and a block. KLOE brought it on defence as well using his experience to bait charges and his quick hands to poke balls loose leading to easy scoring opportunities. He also showed surprising explosion in his step, bursting to the rim for uncontested layups and put backs (yes, I said put backs). Kyle was able to quiet a lot of doubters tonight and now that the scoring monkey is off his back, I expect him to ease into an excellent series. Aaron Gordon has been the Magic’s most consistent player in both games after he put in another strong performance tonight. In game 1, I lauded Gordon’s efforts on the defensive end, tonight I give him this credit for what he did on the scoreboard. Gordon used his otherworldly athleticism to explode to the rim for layups and gorgeous finger rolls. He also knocked down a few open jumpers to keep the defense honest and did his best to check Kawhi (although no one was stopping that man tonight). Gordon poured in a team high 20 points on 8/12 from the floor and added 5 rebounds, 2 assists and a block. Gordon worked through a tough night to lead the Magic in the loss. Last game, I gave Gasol the Pinky credit predominantly for his work on Vucevic. I think that this point needs to be highlighted to a greater extent because it should not be understated how important it is that Big Spain has set up residence on Vooch Island. Vucevic is the Magic’s best player and, so far, he has been a non-factor in this series thanks in large part to Gasol and his defensive work. Marc pushed Vucevic outside his comfort zone and held the All Star to only 6 points. Gasol had active hands coming up with a couple of deflections leading to turnovers. He added 9 points (all on threes), 3 rebounds, 5 assists, and an astonishing 4 steals. The Magic opted to leave Gasol open from behind the arc and he punished them for it again and again. He has quietly been the most important player for Toronto on the defensive end. Pascal Siakam will not get the accolades after tonight’s win, but he stepped up for another solid game. Siakam has shown no signs of playoff jitters, his efficiency and relentlessness has been consistent and reliable. Siakam is the type of player that can score off improvisation, in transition, or within the flow of the half court set. It’s a luxury for Toronto to get positive production from Pascal even without calling plays for him. Siakam gave Toronto a much-needed scoring lift. Unlike game 1 where Pascal did most of his damage in the second half, tonight Siakam spread his scoring throughout the game. Pascal went 50% from the floor scoring 19 points on 16 shots to go with 10 rebounds and an assist. The Magic still haven’t figured out how to slow Spicy P down. I had already decided to give Kawhi Leonard this credit after what he did in the first 4 minutes of action. 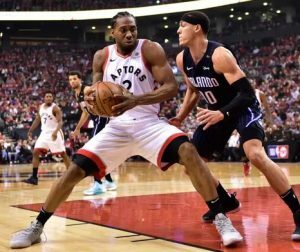 It’s intriguing to watch how Kawhi can adjust his attack to take advantage of what the defense gives him. 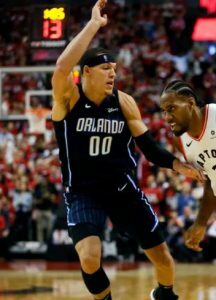 In game 1, Aaron Gordon was able to take away the lane preventing Kawhi from getting to the rim. Tonight, Leonard expected it and used his bag of tricks to get space and elevation in the midrange. Leonard further stretched the defence by going 4/8 from deep to lead Toronto in 3 point makes. He was a monster on the offensive end with easily his best game of the playoffs. The Klaw was in beast mode as he scored 37 points on 15/22 shooting from the floor to go with 4 rebounds, 4 assists and 2 steals. There was an exciting sequence late in the third where he came up short on a layup attempt but sprinted back on D to intercept a pass as the Magic were setting up their offense, only to take it all the way back the length of the court for another tough finish. The Klaw abused Orlando’s defenders with a blistering shooting performance that was truly impressive to watch. Live by the 3 – I knew the Magic would not be able to sustain their hot 3-point shooting after hitting plus 48% of their shots from deep in game 1. The Raptors were able to keep Orlando in check, forcing the Magic to go 26% from distance on 9 of 34 attempts. Plus performers – Each starter for the Raptors were at least a plus 20 in +/- raiting. Franchise win – 29 points is the largest win in Raptors playoff history. So Sensitive –Game 1 nose bleeder, Michael Carter Williams, inexplicably got his name in the headlines again after he reacted emotionally to some of Kyle’s needling late in the fourth. Lowry got under his skin enough that he threw an elbow and a tantrum. Toronto will now head to sunny Orlando to take on the Magic for game 3 on Friday night. The Raptors will have an opportunity to take back home court advantage and wrestle control away from the Magic with a win. AJ Lawson is a RISING STAR! NCAA Coaches watch GAME WINNER in Canada! VIDEO: Lincoln Rosebush, Matthew Sanvido & Tri-City All-Stars!